Particularly during the after-landing roll, special attention must be given to maintaining directional control by the use of rudder or nose-wheel steering, while keeping the upwind wing from rising by the use of aileron. When an airplane is airborne, it moves with the air mass in which it is flying regardless of the airplane’s heading and speed. When an airplane is on the ground, it is unable to move with the air mass (crosswind) because of the resistance created by ground friction on the wheels. Characteristically, an airplane has a greater profile or side area behind the main landing gear than forward of the gear. With the main wheels acting as a pivot point and the greater surface area exposed to the crosswind behind that pivot point, the airplane tends to turn or weathervane into the wind. Wind acting on an airplane during crosswind landings is the result of two factors. One is the natural wind, which acts in the direction the air mass is traveling, while the other is induced by the forward movement of the airplane and acts parallel to the direction of movement. Consequently, a crosswind has a headwind component acting along the airplane’s ground track and a crosswind component acting 90° to its track. The resultant or relative wind is somewhere between the two components. As the airplane’s forward speed decreases during the after landing roll, the headwind component decreases and the relative wind has more of a crosswind component. The greater the crosswind component, the more difficult it is to prevent weathervaning. Maintaining control on the ground is a critical part of the after-landing roll because of the weathervaning effect of the wind on the airplane. Additionally, tire side load from runway contact while drifting frequently generates roll-overs in tricycle-geared airplanes. The basic factors involved are cornering angle and side load. Cornering angle is the angular difference between the heading of a tire and its path. Whenever a load bearing tire’s path and heading diverge, a side load is created. It is accompanied by tire distortion. Although side load differs in varying tires and air pressures, it is completely independent of speed, and through a considerable range, is directly proportional to the cornering angle and the weight supported by the tire. As little as 10° of cornering angle creates a side load equal to half the supported weight; after 20°, the side load does not increase with increasing cornering angle. For each high-wing, tricycle-geared airplane, there is a cornering angle at which roll-over is inevitable. The roll-over axis is the line linking the nose and main wheels. At lesser angles, the roll-over may be avoided by use of ailerons, rudder, or steerable nose wheel but not brakes. While the airplane is decelerating during the after-landing roll, more and more aileron is applied to keep the upwind wing from rising. Since the airplane is slowing down, there is less airflow around the ailerons and they become less effective. At the same time, the relative wind becomes more of a crosswind and exerting a greater lifting force on the upwind wing. When the airplane is coming to a stop, the aileron control must be held fully toward the wind. Takeoffs and landings in certain crosswind conditions are inadvisable or even dangerous. [Figure 8-18] If the crosswind is great enough to warrant an extreme drift correction, a hazardous landing condition may result. Therefore, the takeoff and landing capabilities with respect to the reported surface wind conditions and the available landing directions must be considered. Before an airplane is type certificated by the Federal Aviation Administration (FAA), it must be flight tested and meet certain requirements. Among these is the demonstration of being satisfactorily controllable with no exceptional degree of skill or alertness on the part of the pilot in 90° crosswinds up to a velocity equal to 0.2 VSO. This means a windspeed of two-tenths of the airplane’s stalling speed with power off and landing gear/flaps down. Regulations require that the demonstrated crosswind velocity be included on a placard in airplanes certificated after May 3, 1962. 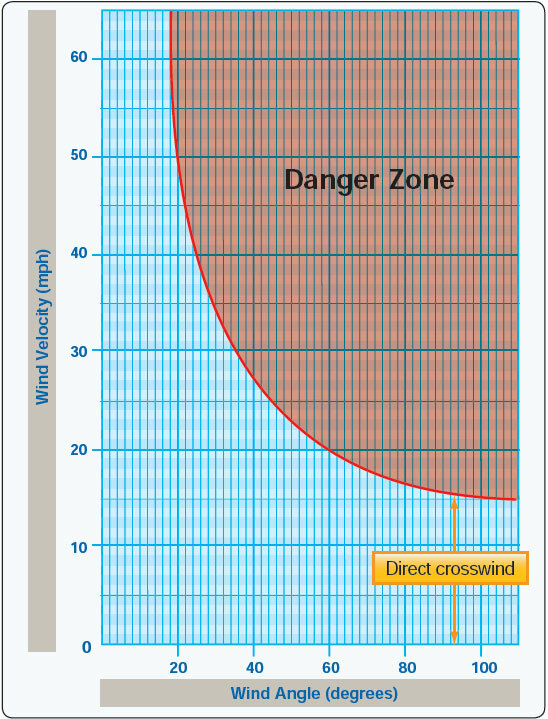 The headwind component and the crosswind component for a given situation is determined by reference to a crosswind component chart. [Figure 8-19] It is imperative that pilots determine the maximum crosswind component of each airplane they fly and avoid operations in wind conditions that exceed the capability of the airplane. Figure 8-19. 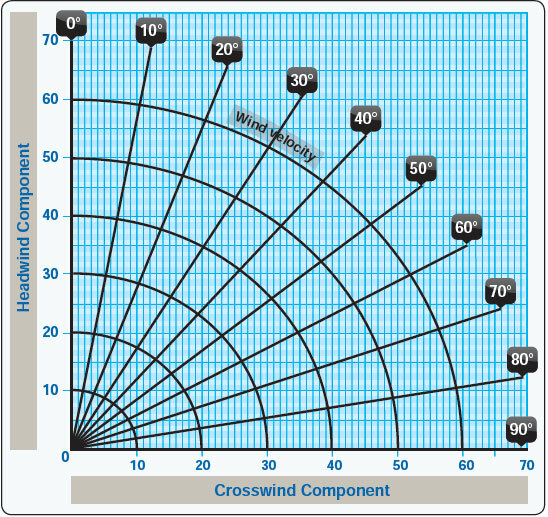 Crosswind component chart.